CLICK HERE TO SIGN UP AT DRAFTDAY! DraftDay is known for 3 nice perks: their Free $5 Challenge, their Perfect Lineup Challenge and they also offer an interesting game called Rapid Fire. The DraftDay Free $5 Challenge is a great promotion that is like a Refer-A-Friend program. When you invite a friend to sign up, you will both receive a $5 Challenge ticket against each other, and the winner will receive $5 for free! As long as your friend is a new player, you can win as many Free $5 challenges as you can get. The Perfect Lineup Challenge is DraftDay's bread and butter, and largest promotion. Players get one free entry every week of the NFL football season and take their chances entering a lineup consisting of: 1 QB, 2 RB, 3 WR, 1 TE, 1 D/ST, and 1 K. If you can construct a perfect lineup, you win $1,000,000!!! But have no fear, for the top 50 lineups also receive a free cash prize. DraftDay's Rapid Fire game is a game in which you simply select which player among the choices will score the most fantasy points. There is an option to enter the DraftDay Rapid Fire Max in which you must select the winner of all 5 matchups they provide. You can play one per game, per sport, per day. Once your buy-in is locked for that contest it is set and you will not be able to edit your lineup. 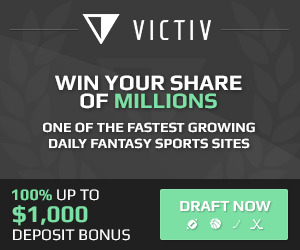 DRAFTDAY.COM - CLICK HERE TO SIGN UP! DraftDay Daily Fantasy Sports has a wide variety of games: Standard, Guaranteed, Rapid Fire, Target, Live Draft, Turbo, 50/50, Modified Salary Cap, and Bracket games! Standard, guaranteed, and rapid fire... you should know them all by now. Target is a game in which you have a target score you must reach in order to win. Live Draft is a live draft where you will have a certain draft pick number and entrants draft their teams. 50/50 games pay out double the entry fee to about the top half of the final entrants based on score! Modified Salary Cap games are games with both higher and lower salary caps then the standard games. Bracket Games are games in which you play against one person and if you win, you advance to the next round. If you make it to the semifinals, the finals, or win the entire bracket, you get paid!! DraftDay also has a nice, easy to use interface with their web-based software. It is quick and easy to sort contests, and also to enter multiple contests at the same time! !